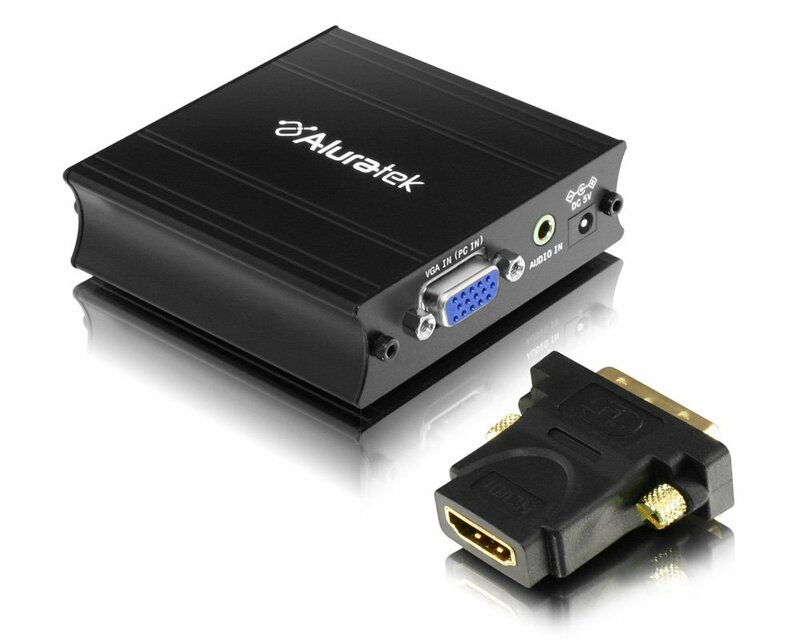 Aluratek's new AVH100F VGA-to-HDMI Adapter is the perfect solution to connect your computer to your HDTV via an all-in-one HDMI connection. Simply connect the included 3.5mm audio cable and the included VGA cable to your computer's VGA port then connect your HDMI cable from the AVH100F converter to your HDTV and you will be able to enjoy stunning HD video quality (1080P) along with superior audio. The AVH100F comes with Aluratek's one year manufacturer warranty. Extend your desktop with high-resolution dual display support. The VGA-to-HDMI adapter supports Primary, Extended, and Mirror modes, with widescreen monitor resolutions up to 1920x1080 and standard monitor resolutions up to 1600x1200. View applications and data simultaneously across multiple screens, or with display continuity. Multitask more effectively without overlapping windows. The VGA-to-HDMI adapter is hot-swappable and hot-pluggable, once the included DisplayLink driver software is installed. Simply connect the VGA connector of the adapter to a VGA port on your laptop, connect the 3.5mm cable to your laptop's audio output, then connect the HDMI connector of the adapter to an HDTV or desktop monitor to view multiple screens and share audio in Mirror mode. Or connect the VGA connector of the adapter to a VGA port on your computer and connect the HDMI connector of the adapter to a second monitor to extend your desktop with display continuity or to view multiple screens. Dimensions: 9.2" x 5.9" x 2.3"